Travel from the ‘Silicon city’ of India, Bangalore to Singapore on the best Bangalore to Singapore flight. Whether you are planning to go on a business trip or just looking for a change of scenery, a Bangalore to Singapore flight will do the trick! We at akbartravels.com will pair you up with the best and cheap Bangalore to Singapore flight without making your bank account wince. Browse through our cheap airfare, and filter by flight times and dates until you get the best Bangalore to Singapore flight online. From flights without layovers to ones that arrive early in the morning, we have it all! If you are planning to travel from Bangalore to Singapore, then you should visit www.akbartravels.com which is India’s leading travel website. It will help you in comparing, finding and booking cheap flight tickets from Bangalore to Singapore. Whether you are booking a one-way flight ticket from Bangalore to Singapore or a return, you can rest assured on getting the best deals and offers on Bangalore to Singapore flight tickets only with Akbar Travels. Booking your Bangalore to Singapore flight ticket online gives you several benefits like insurance, reward points, 24/7 customer support and access to multiple airlines. www.akbartravels.com offers you the widest choice of airlines for Bangalore to Singapore flights so you can choose you’re most preferred date, time, date, and a number of stops for your flight. 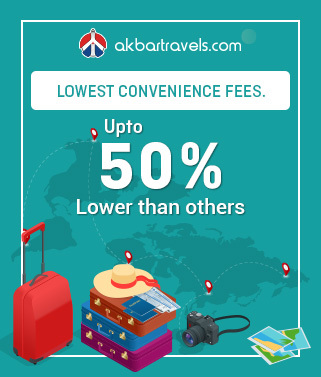 Akbar Travels makes your flight bookings faster, easier and cheaper; thanks to its seamless interface, user-friendly navigation, easy cancellation/refund, and express checkout facility. Located on Deccan highland, Bangalore belongs to the southeastern state of Karnataka. This city is considered as the most developed city of Information Technology (IT) in India and is one of 10 business locations in the world. There are plenty of historical sites, a lot of modern architectural works, and stories of Indian dynasty as well as cool weather in Bangalore. It is not only a home of scientists and researchers but is also one of the most attractive destinations for foreign tourists in India. It is also denoted to as the Silicon Valley of India. Some of the most popular tourist attractions in Bangalore are Lalbagh Botanical Garden, Bannerghatta National Park, Bangalore Palace, Bull Temple, Tipu Sultan's Summer Palace, Lumbini Gardens, Dodda Ganapathi to name a few. There are numerous shopping malls and street markets in Bangalore to satisfy the shopper in you. If you are planning a trip to this city, explore the latest schedules of the flights from Bangalore with Akbar Travels to reach airport as per your flight time. Kempegowda International Airport Bengaluru - KIAL Road, Devanahalli, Bengaluru, Karnataka 560300. Beyond the picture-perfect skyline and the lively city center, there’s still so much to explore for visitors in Singapore. Singapore is also considered as one of the places in the world where you can take your family or friends and be assured of the best entertainment and fun activities. There are some great places to explore and countless activities to indulge into. To name a few distinguished places, Singapore boasts of Gardens by the Bay, Chinatown, Marina Bay, Singapore Flyer, Sentosa etc. Whether you like indulging in gastronomy or if adventure is your soul’s calling, the island city will never dishearten you. The city also has a primary rainforest in the City Centre, 300 parks and 4 nature reserves, and plenty of green spaces to escape the hustle and bustle of the city. With an abundance of world-class, affordable attractions, old school jungle huts, chic cocktail bars and everything in-between, Singapore caters to everybody, from budget backpackers to high rolling billionaires! Where else in the world could you marvel at the gems of the historic Chinatown, tuck into a delightful curry in Little India, before ending the night on the top of the iconic Marina Bay Sands sipping a cocktail? It is a city made up of not just one island but 63 in total. This island city is home to the world’s first night zoo. The Night Safari is a rare experience where you can explore over 2,500 animals. The locals here speak Singlish which is a mix of casual terms and catchphrases used by Singaporeans. It is one of the world’s greenest cities with over half the land area covered with lush forests. Changi Airport, Airport Blvd, Singapore. Deciding the best time to fly to Singapore depends upon whether you want to avoid busy periods during festivals or embrace the crowds and join in the fun. If you want to make the most of the dry weather, then the best time to visit Singapore is during the summer months of June, July, and August. Changi Airport is one of Asia’s best-connected airports and is considered an important hub for international aviation. Mostly all major international airlines fly into Singapore from here. There is regular air traffic from Singapore to several destinations in Australia, Europe, Asia, the Middle East, and North America. Frequently voted the world’s best airport, its facilities include a gym, several gardens, free internet, cafes, an outdoor pool and plenty of shops. Singapore is connected to Johor Bahru, Malaysia, and Kuala Lumpur by rail, with a route to Bangkok. There are three trains per day, counting a sleeper. Trains depart and arrive at the Tanjong Pagar MRT station Singapore. Singapore has two causeways that connect the mainland of Asia and the island to Malaysia. There are regular bus services from 5 am to the middle of the night. Buses are operated by SBS and Causeway Link, with the latter being considerably faster. Singapore is progressively being used as a base for cruises throughout South East Asia. Being an island country, Singapore offers regular ferry services to Riau Islands in Indonesia and Tanjung Belungkor in Malaysia. Singapore is a city bursting with impressive attractions, exciting activities, and plenty of day trips for all the family. Hence, choosing the best things to do in Singapore was no easy task. Pick what tickles your fancy or dive into an adventure that you have never done before. The choice is yours. The cheapest months to that have the lowest Bangalore to Singapore flight fares are March to May. July to September is the best month to travel to Singapore as it has good weather. It is also the month that hosts the Great Singapore Sale as well as the Singapore Food Festival. The airport is located at a distance of 24km from the city centre. The currency used in Singapore is Singapore Dollar (SGD). 1 SGD is approximately valued at 50.48 Indian Rupees. You can check the currency conversion centres for more details. The time difference between Singapore and India is 2hours and 30 minutes. 1.What are the top airlines brands that offer Bangalore to Singapore flights? 2.How many weekly Bangalore to Singapore flights are there from Bangalore to Singapore? - There are approx. 90 flights in a week from Bangalore to Singapore. 3. At what time does the first Bangalore to Singapore flight leave from Bangalore to Singapore? 4.When does the last Bangalore to Singapore flight leave from Bangalore? The last flight from Bangalore to Singapore is Singapore Airlines 503 at 11:10 AM. 5.What are the airport codes of Bangalore and Singapore airports? The airport code of Bangalore is BLR and Singapore is SIN. 6.What is the name of the airport in Bangalore? 7.What is the name of the airport in Singapore? - The name of the airport in Singapore is Singapore Changi Airport. One of the smallest countries in the world: Singapore is in the top 20 list of smallest countries in the world, with a total land area of only 682.7 square kilometers. Symbols of the flag: Red symbolises universal brotherhood and equality of man while white signifies purity and virtue. The crescent moon represents a young nation on the rise and the five stars signify the ideals of democracy, peace, progress, justice and equality. World’s first night zoo: The world’s first night zoo, The Night Safari, is located in Singapore.